Shirakawa Giant Wall of Icicles (白川氷柱群) is the main feature of Kiso Town in Winter. It appears at a cliff side of Mt. Otake where water spring. From the middle of January to the end of February those spring water frozen up and form a giant wall of icicle. It grows up to 50m talls and 250m wide. It is the art of winter that you can see in Kiso, Nagano prefecture. There is parking. Be careful there is not many bus to visit here. 1. use bus to Keyakinoyu. 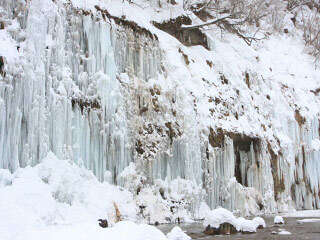 The Gian Wall of Icicles at Shirakawa is the main winter feature of Kiso, Nagano Prefecture. The underground water from Mt. Ontake spring at the cliff of Shirakawa, and in winter, water frozen up and became the huge Icicles. It becomes 50m tall and 250m wide. The entire cliff became the giant walls of Icicle. It appears from the middle of January to the end of Feburary. It has a beautiful lighten up at night. Light up end at 21:30.